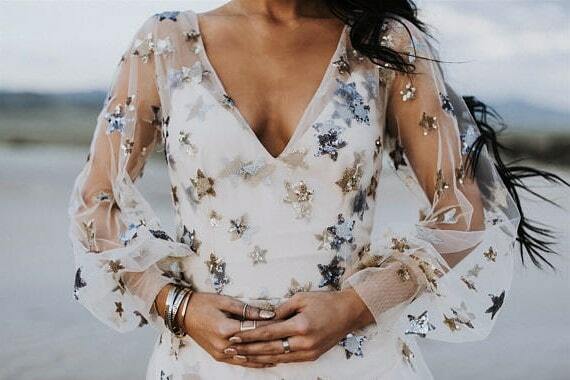 Do you love embroidered wedding dresses as much as we do?We love wedding dresses that are just a little bit different, and these 10 embellished and embroidered wedding dresses are no exception. They tend to have an ethereal and dreamy vibe which is utterly perfect for weddings. These are 10 examples of dresses that a bride with a penchant for detail would suit perfectly, from whimsical couture gowns by high-end designers, to Etsy designs made to order and made with love, to gowns you can buy directly from ASOS (how easy is that!). So there truly is something for everyone on this list. This beautiful, custom-made wedding gown, is in a figure-flattering A-line style. 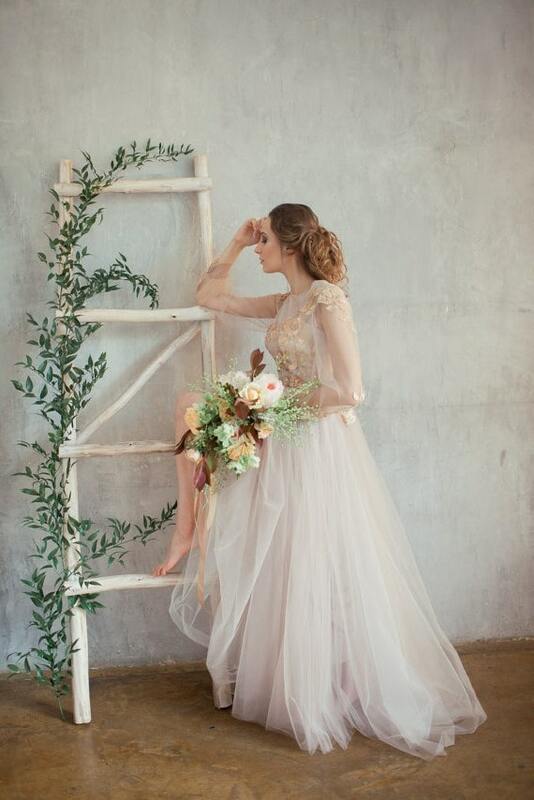 This is an ethereal style and is perfect for an unconventional, rock and roll bride. The beautiful light beige gown is covered in blue and gold stars made from sparkling sequins. Seriously, how DREAMY is this?! Click the link in the title to see the listing for the Starstruck gown by Natalie Wynn Bridal on Etsy. 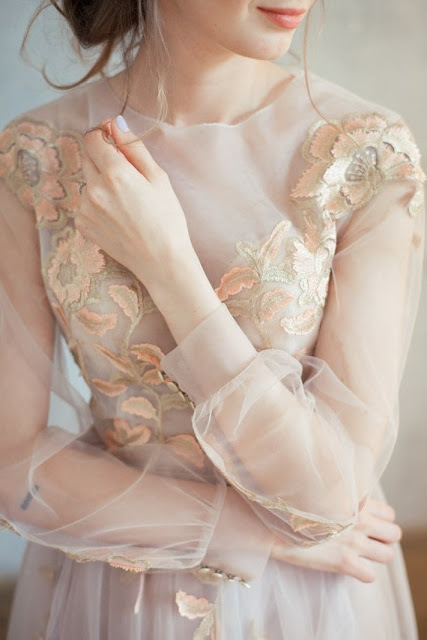 We personally cannot deal with these beautiful sheer, romantic sleeves and embellished tulle. 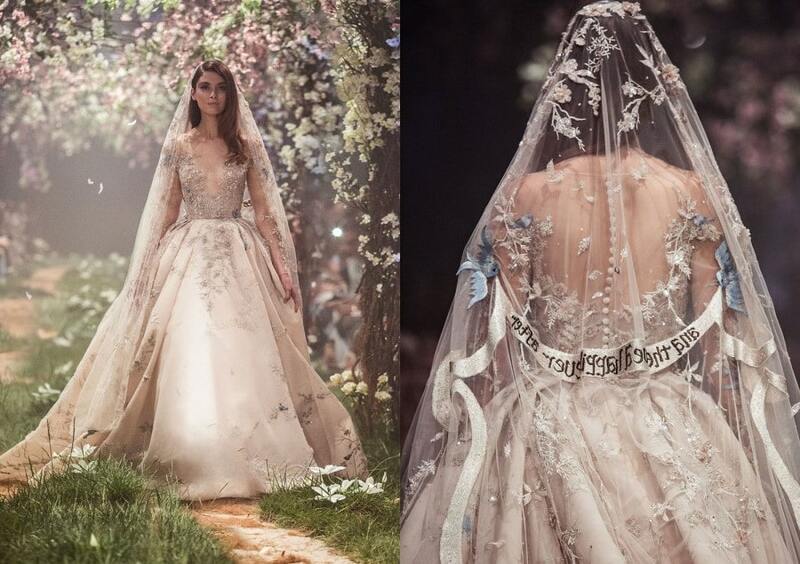 Although not strictly a wedding dress, any Paolo Sebastian gown would look ideal in a wedding setting. 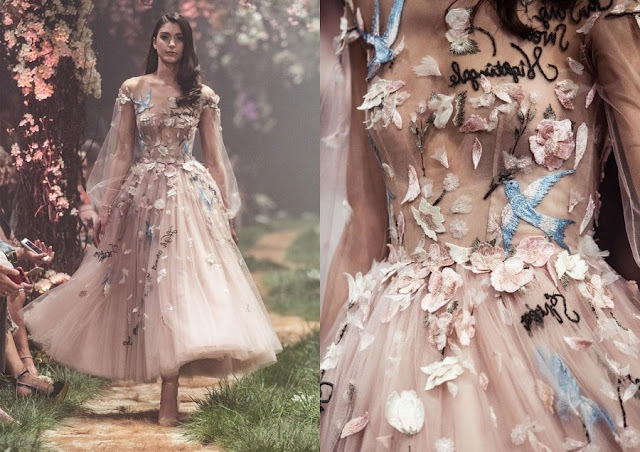 Australian designer Paolo Sebastian was founded in 2007 by Paul Vasileff is well known for their intricate and beautifully detailed designs. To see the whole collection, be sure to visit the link in the title. Okay so the dress is absolutely sensational and almost anyone would agree that this shape and style is both phenomenally flattering but also looks incredibly luxurious. But can we all please take a moment (or 10, I’ll wait) to appreciate this VEIL! Yes, caps are necessary. This embroidered “and they lived happily ever after” veil complete with bluebirds is what fairytale dreams are made of! Someone call Cinderella, she will not believe this. This drop-shoulder ballgown style is perfect for brides who love their look to be just a little bit extra (AKA me). More is more in this case. How stunning! The detail on the entire gown is incredible, and any bride that chooses a gown like this will look like complete royalty. Our advice? Pop on a crown, rock some rubies, hire a butler and call it a day. A Viktoria Novak crown or headpiece would be ideal with this stunning Paolo Sebastian 2018 number. Put your hair in a curled updo for extra royalty points. 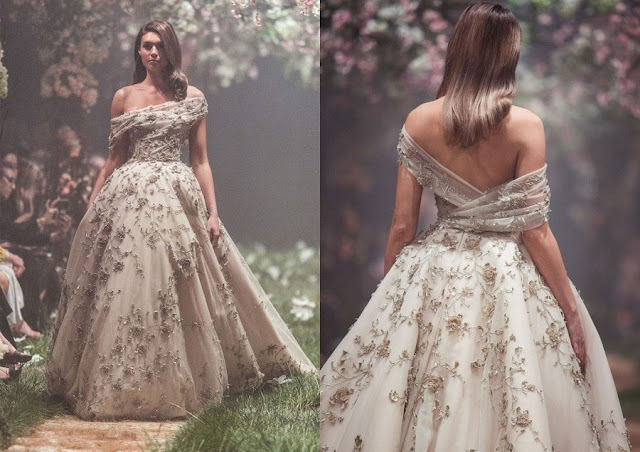 This delicate and romantic beige tulle and silk gown with beautiful gold leaf embroidery is absolute perfection. The lightweight fabrics and relaxed A-line silhouette of the skirt give you the freedom to move on your wedding day. So gorgeous and so feminine. We’re big fans of supporting local or smaller designers, which is why we draw a lot of inspiration from Etsy. If you’d like your dress completely custom made, be sure to see our list of bridal and wedding dress designers in your city. One of the things we love most about this design is that it can be modified to suit you. It can be fully lined for a more modest look, the neckline can be altered, and you can even opt for different sleeve lengths. How great is that! 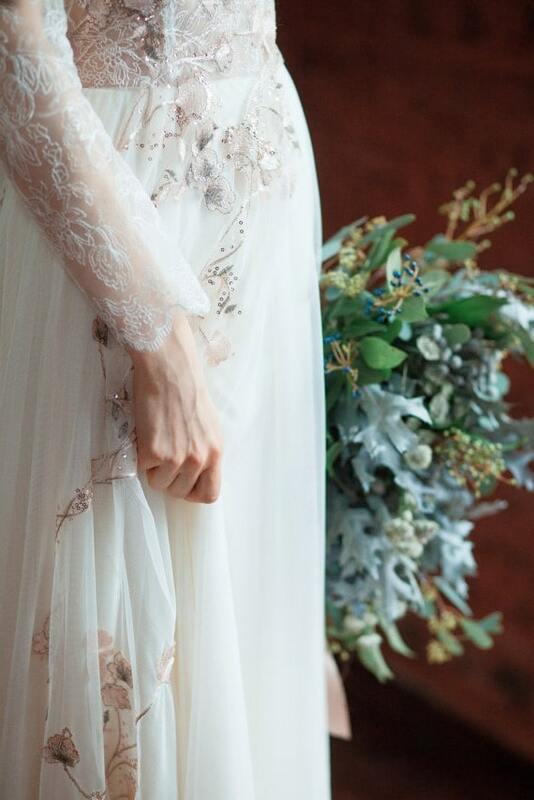 We love the combination of the lace with the gorgeous and delicate embroidery.